George N. Schmidt was passionate about education and fighting injustice wherever he saw it, and he pursued both in his dual roles as a high school English teacher in the Chicago Public Schools and as the editor-in-chief of Substance, the controversial, teacher-produced monthly investigative newspaper that he co-founded that focused on the school system. 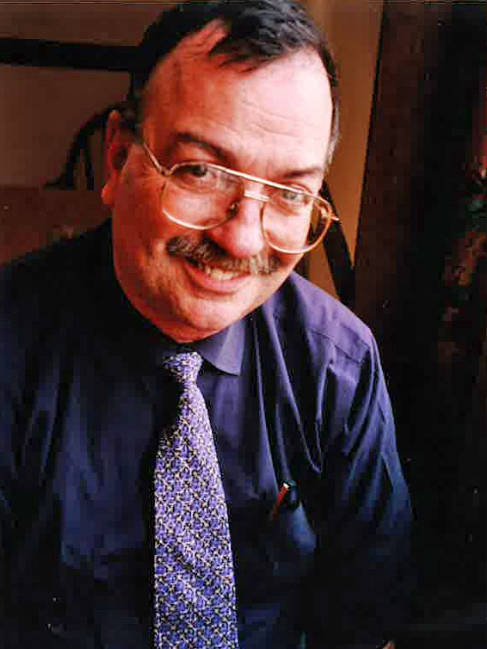 George Schmidt pictured on April 14, 1998. Photo by Sharon SchmidtSchmidt also was known for his educational innovations — he was an early adopter of Apple Macintosh computers, which he brought into his classrooms — and his commitment to teaching lower-income high school students. Schmidt, 71, died of complications from lung cancer on Sept. 17 at his home, said his wife of 20 years, Sharon. He had been a longtime resident of the Northwest Side Portage Park neighborhood. Born in Elizabeth, N.J. to World War II veteran parents, Schmidt grew up in Linden, N.J., where he became an Eagle Scout at age 13. He graduated from St. Benedict’s Preparatory School in Newark in 1964 and then spent two years at Saint Vincent College in Latrobe, Pa.
Schmidt moved to Chicago for his final two years of college, and he received a scholarship to study at the University of Chicago. While there, he studied under future U.S. poet laureate Robert Pinsky and joined the activist group Students for a Democratic Society, and he demonstrated against the Democratic National Convention in Chicago in 1968. After graduating from the U. of C. in 1969 with a bachelor’s degree in English and the humanities, Schmidt took education courses at Chicago State University and Northeastern Illinois University and then worked as a substitute teacher in Chicago’s pubic schools until 1971. A fierce opponent of the Vietnam War, Schmidt also volunteered to be what he termed a “military counselor” for the Chicago Area Military Project — helping educate active and AWOL soldiers while also producing underground newspapers like Vietnam GI and Camp News. Substance cofounder Larry MacDonald, a former Marine, said he “really appreciated” Schmidt’s antiwar activities. Schmidt later stopped teaching for a time and drove a taxicab to make ends meet. He also attended the DePaul University College of Law for two years, studying military law. In 1974, Schmidt returned to teaching in the Chicago Public Schools as a day-to-day substitute teacher at Grant Elementary School and then at Prosser Vocational High School in the Northwest Side Hanson Park neighborhood. In 1975, Schmidt sought to organize substitute teachers. From 1976 until 1983, Schmidt was a regular presence in numerous Chicago high schools, including Steinmetz, Collins, Tilden, Manley, Marshall, DuSable, Gage Park and Kenwood. Then, in January 1984, Schmidt was assigned a steady position teaching English at Amundsen High School in the North Side Ravenswood neighborhood. While at Amundsen, Schmidt taught every level of English and served as the faculty sponsor for the school newspaper. Schmidt also built a reputation for his interest in technology, and after Apple rolled out its Macintosh computer in 1984, Schmidt won grants to bring the new computers into his classroom. Schmidt also was a finalist for the first-ever Golden Apple teaching award in 1986. After a dispute with Amundsen’s principal at the time, Ed Klunk, Schmidt was reassigned to Bowen High School in the South Side South Chicago neighborhood in 1993. While at Bowen, he also served as the school’s security coordinator. Schmidt’s work outside the classroom was as important to him as his time in the classroom. He ran for president of the Chicago Teachers Union three times, and he was at the helm of Substance from the time he helped found it in 1975 until his death. Schmidt started Substance as a newsletter to air substitute teachers’ grievances. Among the stories that the publication broke were challenging claims made by “superteacher” and Westside Prep founder Marva Collins of her success in teaching low-income students, and uncovering how Chicago Public Schools administrators worked during vacation periods to pad their incomes. One of Schmidt’s biggest stories was in April 1985, when Substance broke the news that James Moffat, the principal at Kelvyn Park High School on the Northwest Side, a powerful former deputy superintendent, had been molesting students in his office. Moffat was convicted in 1987 of sexually abusing five students in his office and was sentenced to 15 years in prison. “People need to know the truth to change the horror that is the Chicago Public Schools for (a) large number of children and teachers in the city,” Schmidt told the Tribune in 1989. Schmidt’s work for Substance created no shortage of enemies, including Chicago Public Schools administrators, union officials and local politicians. In 1999, Schmidt’s work for Substance cost him his teaching job at Bowen. In Substance, Schmidt acquired and published, page for page, end-of-semester CASE exams for junior high school and high school students, as a way to highlight what he felt were problems with the exams, which were a cornerstone in Chicago Public Schools’ efforts to reform learning and teaching assessments under new local standards. Schmidt published the U.S. history, algebra, world studies and English exams. Schmidt’s action drew criticism from Mayor Richard M. Daley, schools chief Paul Vallas and school board President Gery Chico, and officials suspended Schmidt with pay and subsequently terminated hm. After his firing, Schmidt worked for the Chicago Teachers Union as a researcher, director of school safety and consultant and also worked for SEIU Local 73 as the director of research. He continued to edit Substance until his death. Two previous marriages, two Linda Haase and Agatha Vasilescu, ended in divorce. In addition to his wife, Schmidt is survived by three sons, Dan, Sam and Josh; a brother, Thomas; and two sisters, Joan and Terry. I think this is a good piece, but the emphasis on George's union work isn't here. This could be because it's for the the Tribune or because Bob used a lot of my background stuff which didn't cover union work as much as it did teaching. There are many more articles on this October 2018 Substance News homepage that show George's passionate work on behalf of his union sisters and brothers. One of the best parts of our funeral service for him was singing Solidarity Forever – "for the union makes us strong." I read Substance in the younger days of my career, but I didn't know you or George until my later days. George proved that bringing up the hard questions and the challenging points was not a strategy to tear down the union, but a way to improve it. No one knew more about CPS as a whole, all the cogs, widgets and hubs. He and you were founding members of CORE. I don't forget this. You mentioned this at the funeral: When there was an attempt to oust George from CORE, it was the very people who were going to be used as the reason for the ouster who stuck up for him with the historical truth. People told so many gooey, complimentary testimonials, that I felt I should defend him on the basis of his more embattled characteristics! George was a tough unionist, but he engendered loyalty among those who knew him. Not everyone was a fan. He wouldn't have expected less, knowing the high standards he held for himself. I am, and I add my name to a long list of unionists who are. CPS stole his career, but he reinvented himself and STILL remained a teacher and in the union. I am sorry that his back problems and his cancer stole the vitality that bolstered us. I am sad to learn of Mr. Schmidt’s passing. I met him while I was a student at Bowen High School during the mid 90’s. He was an English teacher and also head of security at our school. He ran the school’s newspaper as well. I was a very opinionated teenager who was student council president and often disagreed with school policy. Mr. Schmidt and I disagreed on the school’s approach to reduce gang violence. At one point I organized a school walk out and petition. It came as a surprise to me when Mr. Schmidt shared stories with me of when he was a student activist. I thought perhaps he might have been encouraging me to continue standing up for my beliefs. During this time our First Lady was Hillary Clinton. For her birthday she invited student reporters and photographers from Chicago public schools to celebrate her birthday at the Chicago Historical Society. I was surprised, honored and forever grateful that Mr. Schmidt chose to me as one of the students. I still have the program from that event. It meant a lot to me. Mr. Schmidt, thank you for believing in me, when most other grown ups only wanted to discourage me. Thank you for trying to make big impact in your students. I am sure there are many more stories like this out there. You are the type of teacher that students remember forever.